This beautiful safari / jungle theme design would be just perfect for the baby or toddler in your life. 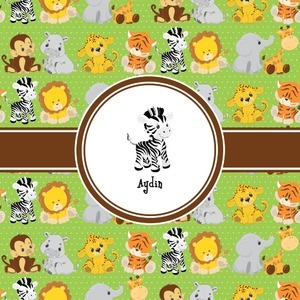 The design has super cute and adorable baby animals - monkey, hippo, leopard, tiger, zebra, lion, elephant and giraffe. The baby animals are on a polka dotted background which is available in multiple colors including black or white. So you can keep it unisex with the light green, light yellow, white or black background, or you change it to baby blue for a boy, or baby pink or purple for a girl - the choice is yours! The design has classic ribbon along with a classic round label in a beautiful earth brown The label features a baby zebra in this design, however the choice of the baby animal is yours. You can select any of the baby animals to be featured on the label along with the child's name.